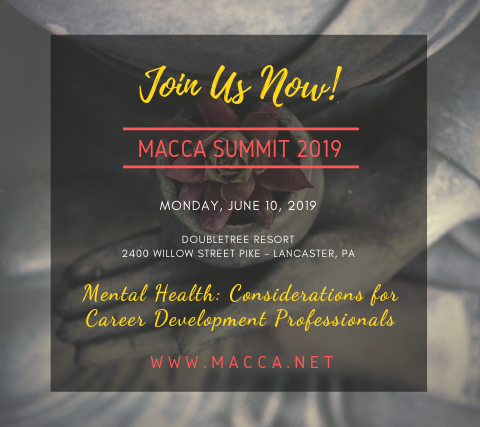 MACCA’s mission is to provide a specialized, supportive and diverse organization where career professionals in the Middle Atlantic States can enhance the quality of their skills while networking and collaborating with others in the field. Affordable semi-annual conferences provide opportunities to hear quality speakers who educate on relevant information and to offer CEUs whenever possible. Our members and targeted audience includes professionals who are career counselors/coaches, school counselors, counselor educators, academic advisors, as well as workforce development, counseling center, organizational development, human resources, and business/government professionals. In our professional and independent roles, we have a responsibility to care for and support those we serve. The impact of a Mental Health diagnosis has become increasingly important for us to consider in relation to our work with clients in their vocational/career development, and subsequent choices. Did you know? •	By 2030, one in five Americans is projected to be 65 and over; by 2044, more than half of all Americans are projected to belong to a minority group (any group other than non-Hispanic White alone); and by 2060, nearly one in five of the nation's total population is projected to be foreign born. (US Census Projections) •	Approximately 1 in 5 adults in the U.S. or 18.5%—experiences mental illness in a given year. Approximately 1 in 25 adults in the U.S. or 4.0%—experiences a serious mental illness in a given year that substantially interferes with or limits one or more major life activities. (National Alliance of the Mentally Ill) •	In U.S., the estimates of the LGBT population has risen to 4.5% (Gallup) •	The American Community Survey (ACS) estimates the overall rate of people with disabilities in the US population in 2015 was 12.6%. •	The number of workers in occupations requiring average to above-average education, training and experience increased from 49 million in 1980 to 83 million in 2015, or by 68%. (Pew) •	Of the 234 companies that own almost 2,000 of the world's most recognized consumer brands, only 14 of the companies had a female CEO, while nine of them had no women at all serving in executive positions or on their boards (LedBetter research group) There really is Strength in Diversity! MACCA is here to help you with a stellar group of concurrent sessions designed to give you the skills to meet the challenges of a rapidly changing work world and an increasingly diverse population. Join us for sessions on how to support cross-generational communication, opportunities for international students, counseling LGBTQ clients, assisting clients with disabilities, and promoting the gender, racial and social equity of the individuals we assist.